Our President, Fred Muench, was invited to join an online discussion of experts from the technology space, public sector and nonprofits on Tuesday, November 13. 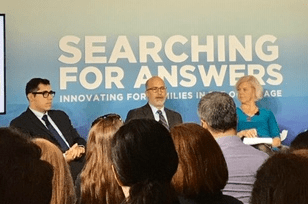 Titled “Searching for Answers: Innovating for Families in the Opioid Age,” the panel discussed ways in which the internet can help families who have been impacted by addiction find guidance, treatment and support. The live webcast was led by Beth Macy, renowned journalist and author of “Dopesick: Dealers, Doctors, and the Drug Company that Addicted America.” Joining Fred on the panel was Justin Luke Riley, President and CEO of Young People in Recovery. Fred spoke about the challenges that many families face when seeking treatment for a loved one who has struggled with opioids. In response to these challenges, he highlighted various resources and customized services from our Parent Helpline that ensure that every family receives free, personalized support. The event was sponsored by Google, Facebook, Twitter, The Center for Safe Internet Pharmacies and the Internet Association.